Make your guests feel at home the minute they hit your door with the Welcome Sunflowers Door Mat. A fantastic sentiment and design for your Autumn Doorfront, this coconut-coir doormat does double duty and cleans off the Rainy Days of Fall as well. Complete with a sunflower and fall leaf pattern design this rug signals Fall is here and welcome. (1) Welcome Sunflowers Door Mat, 30″l x 18″w. Welcome home to a mat made for Fall with the Welcome Sunflowers Door Mat. This coconut coir based rug contains a light yellow background with Welcome in Bark Brown and Sunflower designs with Fall leaves surrounding the text. Perfect for your front door and keeps the mud out from your home. This is a large size entry-way mat. Designed with a PVC backing for hardy wear. 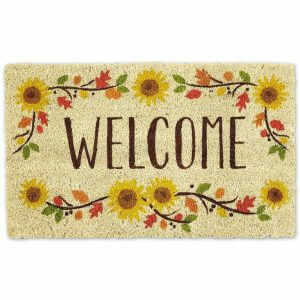 Create a heart warming message of Fall for your guest before they even step a foot in your door with the Welcome Sunflowers Door Mat. Care: Shake Briskly to Clean. Wipe with bristled brush for dried mud. Hardy rug for front or back door.